Please mark your calendar for the important KCS activities for the year 2019. # Dates are subject to change due to any unavoidable circumstances. In addition to the above activities, many other new programs are also being planned by the KCS Board of Directors and our satellite units such as Kids Club, KCJL, KCYL, Yuvajanavedhi, Wome's Forum, Senior Citizen Forum, and Goldies club. Sports Forum is planning various sports tournaments throughout the year ( such as basket ball, volley ball, cricket, flag football, badminton and tennis). Professional forum is planning various educational activities for our teens and youth. Dates of those programs will be announced later. Please attend each activities and make KCS as a vibrant organization. Chicago KCS is conducting a pilgrimage to Holy Hill, WI on April 13, Saturday. This is the day before Palm Sunday. We will be starting from Knanaya Center, Des Plaines at 630 AM. We will go on a tour bus. Once we reach there, we will do a Way of the Cross. We will provide breakfast and lunch to the participants. We will be charging 50 $ per head. Since the seats are, limited those who are interested, please register their name with our Tours and Pilgrimage Committee Chair Sibu Kulangara at 224 425 3625 or KCS President Shiju Cheriyathil at 847 341 1088 before April 6, 2019. We are very happy and proud to inform you that our national council member Sunny Mundaplackal is elected as the new KCCNA Vice-Pesident by getting more than two thirds of the votes.in KCCNA election conducted yesterday(03/23/2019) at New York. Mr. Alex Paicattu is elected as the new Regional Vice President (RVP Chicago) of KCCNA and Sonthosh Kalarickaparambil is the new DKCC representative of KCCNA. Chicago KCS congratulates all the winners and wish them success in their new positions. The Executive Committee Members and the KCCNA National Council members of Knanaya Catholic Society of Chicago (K.C.S) are extremely proud to endorse unanimously our own Sunny Mundaplackal, a staunch supporter of the core principals of Knanaya identity, for the position of KCCNA Executive Vice- President, for the term 2019-2021. Sunny Mundaplackal acquired a great deal of leadership skills stemming from his experiences, which spanned over thirty years, as KCS Joint Secretary, KCCNA Convention Convener, KCS Laison Board member, KCS Legislative Board member and various leadership roles held for Chicago Malayalee Association. Sunny is honest, pragmatic and has helpful insight into our community’s problems and needs. Similarly, his willingness to examine the issues and listen closely to the public’s questions and concerns, sets him apart from others. In all he does, Sunny exemplifies integrity, fairness and thoughtfulness. With pride and enthusiasm, we unequivocally endorse Sunny Mundaplackal as our candidate for the Office of KCCNA Executive Vice- President. We request all the other KCCNA National council members to support Sunny Simon Mundaplackal. As you all know, we are experiencing historic low temperature in Chicago on these days. Please stay warm and listen to the official instructions from the civic authorities. Please check the well-being of others. 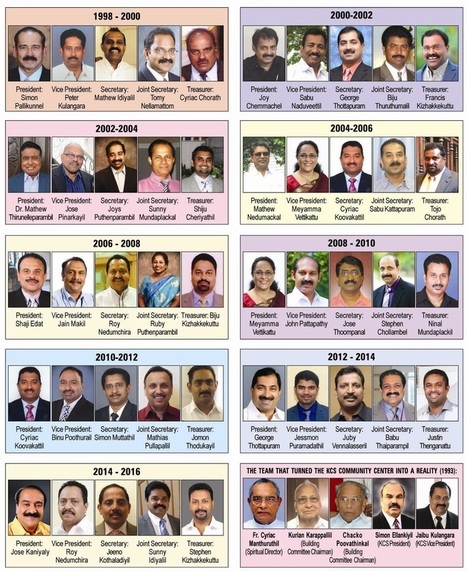 Shiju Cheriyathil : 847 341 1088, James Thiirunelliparampil: 847 858 5172, Roy Chelamalayil: 773 319 6279, Tomy Edathil: 847414 6757, Jerryn Poothakary: 708 890 0983, Jino Kakattil: 847 224 016, Shibu Mulayanikunnel: 630 849 1253, and Pramod Vellian: 847 558 9789. KCS is conducting Christmas Carol to spread the message of Christmas. The upcoming KCS board under the leadership of the President elect Shiju Cheriyathil will lead this years' Christmas Carol. A Christmas carol committee is formed with Vice-President elect Jamel Thirunelliparampil as the General Coordinator and KCS board members from each ward as the area coordinators. We have planned to make this year's Christmas carol as a family event. Please support the KCS Carol team and invite them to your house when they approach you. We are also inviting you to participate in the carol team with family to make this a unique experience. In preparation for the Christmas Carol, Baby Jesus statue's were blessed by Fr. Bins Chethalil after the Sunday mass at St. Mary's Knanaya Catholic Church. Below is the pictures taken after KCS leaders and Koodarayogam representatives from the Church received the blessed statues from Fr. Bins.Chethalil. ഷിക്കാഗോ ക്‌നാനായ കാത്തലിക് സൊസൈറ്റിയുടെ പോഷകസംഘടനയായ വിമന്‍സ് ഫോറം പുതിയ ഭാരവാഹികളെ തെരഞ്ഞെടുത്തു. സ്ഥാനമൊഴിയുന്ന പ്രസിഡന്റ് ജിജി നെല്ലാമറ്റത്തിലിന്റെ അധ്യക്ഷതയില്‍ ചേര്‍ന്ന വിമന്‍സ് ഫോറം പൊതുയോഗത്തില്‍ വച്ചു 2019 20 വര്‍ഷത്തെ ഭാരവാഹികളായി താഴെപ്പറയുന്നവരെ തെരഞ്ഞെടുത്തു. ആന്‍സി കുപ്ലിക്കാട്ട് (പ്രസിഡന്റ്), ചാരി വണ്ടന്നൂര്‍ (വൈസ് പ്രസിഡന്റ്), ഡോ. ബീന ഇണ്ടിക്കുഴി (സെക്രട്ടറി), ആന്‍ കരികുളം (ജോയിന്റ് സെക്രട്ടറി), ഡോളി ഇല്ലിക്കല്‍ (ട്രഷറര്‍). വിമന്‍സ് ഫോറത്തിന്റെ പ്രവര്‍ത്തനങ്ങള്‍ കൂടുതല്‍ വിപുലീകരിക്കുന്നതിന്റെ ഭാഗമായി 36 ഏരിയാ കോര്‍ഡനേറ്റര്‍മാരേയും തദവസരത്തില്‍ തെരഞ്ഞെടുത്തു. പുതിയ ഭാരവാഹികള്‍ക്ക് ആശംസകള്‍ അര്‍പ്പിച്ചുകൊണ്ട് സെക്രട്ടറി ബിനി തെക്കനാട്ട് സംസാരിച്ചു. ഡിസംബര്‍ എട്ടിനു നടന്ന കെ.സി.എസ് പൊതുയോഗത്തില്‍ വച്ചു കെ.സി.എസ് സ്പിരിച്വല്‍ ഡയറക്ടര്‍ ഫാ. ഏബ്രഹാം മുത്തോലത്ത് പുതിയ ഭാരവാഹികള്‍ക്ക് സത്യപ്രതിജ്ഞ ചൊല്ലിക്കൊടുത്തു. നോര്‍ത്ത് അമേരിക്കന്‍ ക്‌നാനായ സമുദായത്തിലെ തിലകക്കുറിയായി പ്രവര്‍ത്തിക്കുവാന്‍ പുതിയ ഭാരവാഹികള്‍ക്ക് എല്ലാവിധ സഹകരണവും കെ.സി.എസ് പ്രസിഡന്റ് ഷിജു ചെറിയത്തില്‍ വാഗ്ദാനം ചെയ്തു. വിമന്‍സ് ഫോറത്തിന്റെ പുതിയ ഭാരവാഹികള്‍ക്ക് ക്‌നാനായ റീജിയന്‍ വികാരി ജനറാള്‍ മോണ്‍. തോമസ് മുളവനാല്‍, അസി. വികാരി ഫാ. ബിന്‍സ് ചേത്തലില്‍ എന്നിവര്‍ ആശംസകള്‍ അറിയിച്ചു.